Premium Koh Rok Koh Haa Speed boat Tour. Following a similar itinerary to our other Koh Rok & Koh Haa trip, this one operates from Krabi and the other from Phuket. By far one of our best and personal favourite trips, this Premium Koh Rok Koh Haa Speed boat Tour takes you 2 of the most beautiful island locations that still have some really beautiful snorkeling and vibrant coral colours. Starting at Koh Rok you can do some swimming to cool down and snorkeling around the pretty coral formations. The beach here at Koh Rok is a beautiful white sandy beach and it is so big you can just find your own space somewhere under a tree and relax. This tour is really not crowded, a great option for you if you want to have a bit of a slower day with not many people around you. After eating a tasty lunch on Koh Rok, next stop Koh Haa is also amazing, really clear waters and vibrant reef coral colouring. Check in. and enjoy a light breakfast, coffet and tea as you receive a briefing of the day by our eco-alert tour guide. Departure for Rok Island by the best fiberglass Speedboat CAT. Arrive at Rok Island enjoy snorkeling, swimming and relaxing on the beach. Enjoy a home cooked delicious Lunch with selection for soft drinks and juices. Scenic boat ride around Koh Rok’s southern island and stop for some swimming and snorkeling. 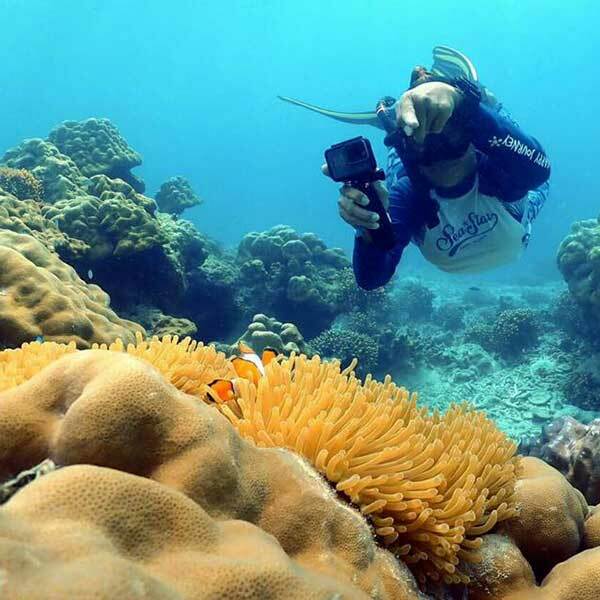 Arrive at Koh Haa island enjoy snorkeling at an amazing coral reef. Return trip, enjoy the beautiful scenery of Phi Phi island. Arrive at the pier and transfer to the hotel with backpack full of wonderful memories.